Angelina Mosley in front of one of her wall-size murals at her home studio in Rancho Cucamonga. After a six-year battle with cancer, she approaches her business with a fresh appreciation to live out her passion for art. What I love most about being an artist is the process of expressing the glories of this world on canvas, whether it is a mural of some beautiful location, a still life, or capturing the unique essence of a human being through portraiture. I feel an urge/need/compulsion to paint. What better way to make a living than by doing something that one loves? It is a blessing to love to go to work! At what age did your interest in art begin? At about age three or four years old. Did you draw or paint often as a child? What kinds of things interested you as art subjects? As a child, people interested me, but I loved drawing faces more than anything else, especially the eyes. I still love painting faces! Who taught you your first art lesson? I remember an art teacher who traveled around the school districts in the San Gabriel Valley and taught elementary school children how to paint in watercolor. I think his name was Mr. Rogers. I always loved art. Even as a very young girl in Germany, the best gifts I could receive were paper, pencils, and/or crayons. Any blank surface was fair game when it came to my artistic expression. My father was in the military, so we lived in many different states and countries, which exposed me to the art and architecture of other cultures and heightened my imagination and appreciation for color and form. In elementary school, I would always take charge when it came to group art projects, and I usually won all the art competitions (I remember several in the 5th grade). In high school, I took art classes all four years and won several district art competitions. Did any of your teachers tell you that you had a natural talent for art? All of my high school art teachers encouraged me, and even one of my biology teachers thought I should pursue a career in art (he thought my drawings of lab specimens were exceptional). Was either one of your parents artists? My entrepreneurial mother sold the paintings of her artist friends in Germany. She had many of their works in our home. My mother worked as a draftsman in the Soviet Union, so she had a very good artistic eye. But my mother, a survivor of Soviet KGB interrogation and torture, was a practical woman and was against my pursuing a career in art. She persuaded me to work toward a dental or peri-medical degree, because she had known too many artists in post WWII Germany who couldn't sell their art. Throughout my childhood, several of my mother's artist friends would visit us, and knowing my interest in art, would sketch for me. This thrilled and inspired me! Did your parents expose you to other art forms? Yes, I was exposed to classical music, which I have studied from youth, and I still play classical piano today. As a youth, I performed in numerous student concerts. What art medium is your favorite? My favorite medium is oil, but I also love painting murals, which I paint in acrylic. Isn't it trued that despite your talent and love for art, you didn't make art a career for many years, but instead followed your mother's advice and opted for a career in the medical field? Yes, I was trained and worked as a respiratory therapist. How long did you work as a respiratory therapist? When did you discover your abilities in interior design? Actually, I knew that I loved it when I was designing and building Barbie furniture and planning room layouts when I was a child. Then when I married and we bought our first home, which was a fixer-upper, I had a wonderful time decorating it. When friends visited, they would ask me for help decorating their homes. It was then that I realized that decorating didn't come naturally to everyone. Did you go to school for interior design? Yes. 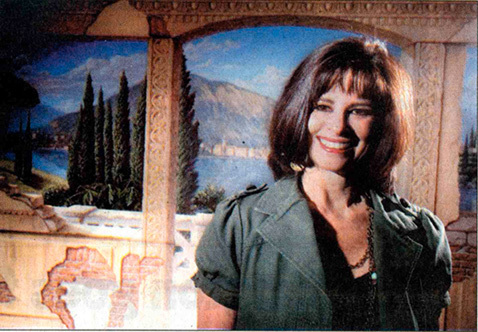 In 1986, I began taking interior design classes at Chaffey College in Alta Loma, California. What was your first interior design job? I had a client who lived in La Canada. I decorated his entire 4500 sq. ft. home. To do this, I developed contracts with design centers, fabric companies, drapery workrooms, etc. I laid out all of his floor plans, designing furniture placement; developed his color schemes based on existing flooring; purchased all of his furniture, wall coverings, lighting fixtures, and accessories; and designed draperies, some area rugs, bedspreads and pillows (a workroom fabricated them). I absolutely loved the design work, but I had quit my job as a therapist to stay home with my children. And, while I loved interior design work, it was too time-consuming and it took me away from my primary goal, which was to be there for my children. So, I set my interior design career aside and took up floral design, which allowed me to work when the girls were either in school or asleep. You eventually decided to home school your daughters. Did you share your artist talents with them as part of their home schooling? Absolutely! I began home schooling my daughters in 1993 and continued until my youngest graduated high school in 2003, so I home schooled them for 10 years. During my home school lessons, I related everything to art. For example, when we studied history, art projects could involve pen and ink assignments with watercolor washes to depict historical sites. When studying famous people, they learned about grid drawings and how to draw the historical figures in proportion. I also taught them art classes, in which they learned how to draw in pencil and ink, paint in acrylic and oil pastel, and we studied art history. I have an extensive library, which has always included a great many art books. And, art lessons were always coupled with classical music, which played in the background. Today, my youngest daughter Andrea is an instructor at the Laguna College of Art and Design. In 2009, she received a scholarship for the Master Painting program at Angel Academy of Art in Florence, Italy. Andrea entered an International Art Competition in 2008 and won first place, and in 2010, she won third place. She is already developing a reputation as a young up and coming artist. Students have contacted her from around the US to be taught in our home studio here in Alta Loma. She has also taught at Los Angeles Academy of Figurative Art. She has sold painting to private clients and has had showings in Florence, Italy, as well as here in the States. Her goal is to become a gallery artist. I am so proud of her and so glad that I could give her this start. Did you take art classes as an adult? Yes, when Greg and I were newlyweds, I took painting classes at Mt. San Antonio College. The classes taught me nothing. Projects were just assigned, and we were told to go to it! So, I painted, but learned nothing that was not self-taught. Then, before I began home schooling my daughters, I had planned to start a decorative painting business, so I took classes with a faux finisher in Mission Viejo, but life is full of twists and turns, and I ended up putting the business on the back burner and home schooling the girls instead. When were you finally able to pursue your career in art as a profession? After my youngest daughter, Andrea, graduated from high school in 2003, I decided to pursue my passion for art. Since I had so much experience in decorating and floral design, I decided I wanted to blend interior decorating with my love of painting, so I decided to pursue mural painting training. With that in mind, I took a semester class in linear perspective at Mt. San Antonio College. Perspective was the breakthrough during the renaissance, which allowed artists to create realism by accurately placing objects in their proper place on a 2-D plane to create the illusion of a 3-D scene. So, my perspective class was extremely valuable. I believe that all artists who want to paint more than just solitary figures, such as portraits, should study perspective to be able to create believable scenes, whether interior or exterior. After this class, I began painting feverishly. I painted for churches and private residences. Since I believed that being able to paint convincing marble would be useful in classical murals, in 2004, I flew to Villa Park, Illinois, to take a workshop with French master marble painter, Pierre Le Fumat. In 2005, I flew to Florence Italy, to study classical realism at the prestigious Angel Academy of Art. I have approached painting differently ever since. All of my art classes up to this point (except linear perspective) had only assigned projects and never taught methods. The classes in Italy were an epiphany in my ability to paint. I learned about modeling, soft and hard edges, lost and found edges, selective focus, fall of light, color palettes, proper application of the various steps in oil painting, correct mediums to use, and the reasons behind all of the above. Since most murals are painted in acrylic, I decided to learn the mechanics behind acrylic painting. All of my previous paintings done in acrylic were painted intuitively. I wanted to learn the hows and whys of acrylic painting. So, in 2006, I took several weeks of painting classes with successful muralist, William Cochran, in Northern California. Color theory came alive in his classes. I was taught that I could condense the number of tubes of paint I needed. I learned to paint a full-color painting, using only yellow, magenta, blue, and, of course, white! Furthermore, I learned the importance of cool versus warm colors. Finally, I wanted to study with a muralist who was a real master in landscape painting, so in 2007 and 2008, I flew to Connecticut, to study landscape painting with renowned French muralist, Pascal Amblard. Pascal is so multi-faceted that I not only learned more tricks of the trade, but he taught me a new way to approach painting landscapes and architecture. Furthermore, all of my linear perspective training was reaffirmed large-scale and from the vantage point of a muralist, not an easel painter. I have always drawn and painted intuitively. Taking classes from professionals has broadened my expertise and taught me the tricks of the trade in my new career. Learning from master painters truly speeds up the process. It opens one's imagination to new ways of approaching various painting and design situations. Also, being around other artists who are as excited about painting as I am, is always very inspirational. My artwork is both decorative painting and fine art. As I mentioned previously, in my desire to blend my two passions, art and decorating, I decided to pursue mural painting. I love the process of meeting with my clients and fleshing out their visions on canvas. After the paintings are complete, my greatest thrill is when they tell me that my artwork transports them to a place of their dreams, one that I have been able to create for them on canvas and apply to their walls. One of my clients was so thrilled with her mural, that she had a catered event with champagne at the unveiling of my artwork, and invited 50 of her friends to the event. This has led to several commissions and contacts with architects and interior designers who want to refer me to clients of their own. However, I just love to paint, and do not want to limit myself to painting murals. I absolutely love painting portraits and have been commissioned to paint portraits and to illustrate books. In the late 1980s, I started out doing home parties as a floral designer and developed quite a large client base. They loved my work so much, that eventually many clients would just send me fabric or wallpaper swatches, and ask me to design arrangements to complement them. They were so confident in my creations that they never gave any guidelines, believing that what I designed would be just right! I had so much work that I was at a crossroad of either opening a shop and hiring help or refusing work. That is when my husband's job required that we relocate to Germany for six months, once again putting my career on a back burner. How many years have you been a full-time artist? Approximately ten years, if I include floral design and interior design. But I have been doing art in one form or another for as long as I can remember. Do you plan to take future classes abroad or in the states? My goal at this point in time is to grow my portfolio and experiment with everything I have learned so far. But there is always something new to learn. So, yes, I am a life-long learner, so I will pursue additional classes as time permits. I love to learn!! Any plans to have gallery showings in the future? After I have created a large body of work, I plan on approaching some galleries in Southern California. What would be your ideal career outcome? I want to share my art expressions with the world. I want to paint and bring joy to the viewers of my artwork, be it though murals, portraits, or anything else realistic. I have a passion for painting. I feel a burning desire to paint. What better way to make a living than by doing something that one loves? It is a blessing to love to go to work!